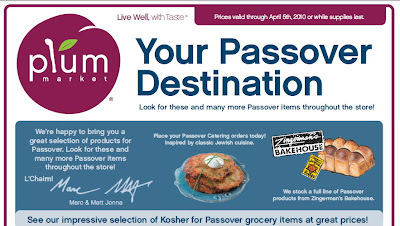 The Rabbi with a Blog (Rabbi Jason Miller): Kosher for Passover Zingerman's Challah? Kosher for Passover Zingerman's Challah? A couple of years ago, I wrote about the signs at Balducci's, a New York grocery store, that advertised their ham as "Delicious for Chanukah." First, Zingerman's, based in Ann Arbor, is not a kosher establishment. Second, their products are not kosher for Passover. Many apologies from Zingerman's Bakehouse for the misrepresentation in this ad and the promotion of challah for Passover. We are not a kosher bakery and never promote ourselves as one. Our Jewish baked goods are available for those who do not follow the laws of Kashrut to enjoy. Good Pesach! What a very nice and sincere apology. I really don't think it's necessary though. You see, I don't think anyone who refrains from eating chametz on Passover will even think twice that Zingerman's challah is kosher for Passover. I just thought it was a funny ad. Ads like this show up from time to time. A colleague told me that she once saw an ad for kosher for Passover clam chowder soup! Zingerman's and Plum Market are both wonderful businesses that generously give back to our community. The Jonna brothers (Marc and Matt), and their father Eddie who owned Merchant of Vino, are wonderful people and exceptional businessmen. Plum Market has a great selection of kosher wines and kosher foods. In fact, the rest of Plum's full page ad contains good prices on kosher for Passover food and wine. So, while your apologies are nice (and appreciated), I hope you'll understand this was only posted for the comedic value of the "Passover challah."